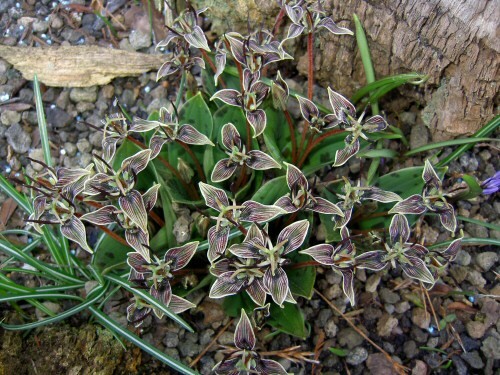 Scoliopus is a genus in the Liliaceae family with two species that are native to cool moist woodland in Oregon and California. 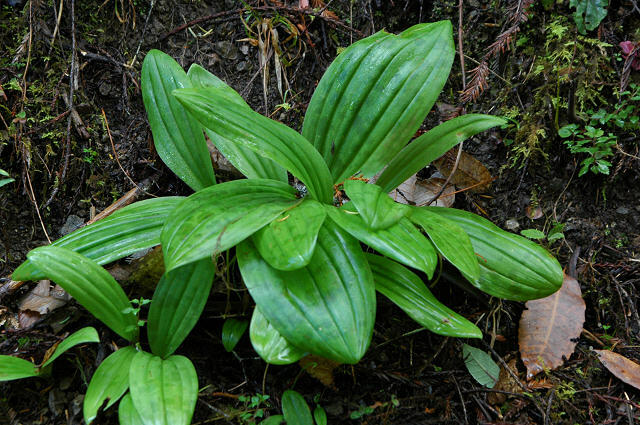 They are one of the fringe geophytes with underground stems with numerous fleshy storage roots. 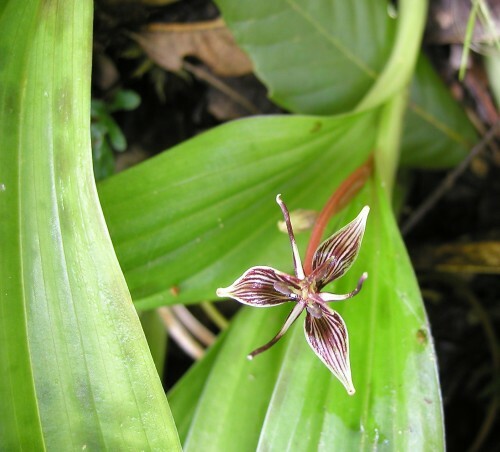 They are known by common names of slink pod because of the long seed pod that "slinks" and buries the seed in the ground and fetid adders-tongue because they have a fetid scent although it is not very strong and you have to get very close to smell it. 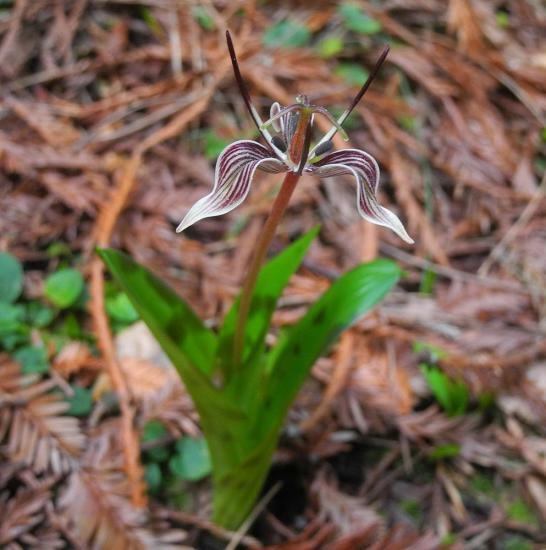 They bloom late winter to early spring, one of the early wildflowers in their native habitat. 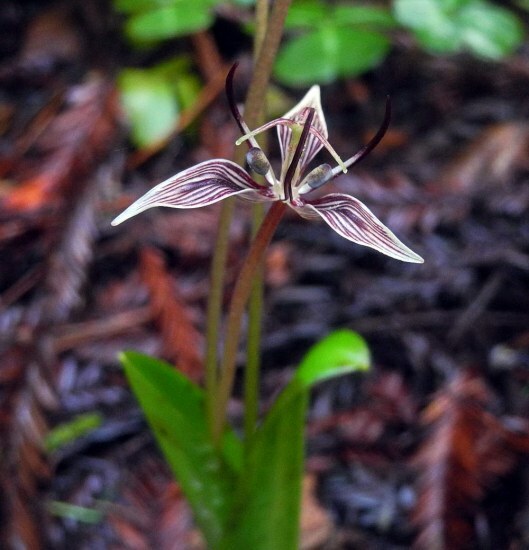 Scoliopus bigelovii is a northern coastal California species that is found in very wet habitats: mossy streambanks and moist, shady forests. The first picture was taken May 2003 in Sonoma County, California. A later picture, also taken in the wild shows the leaves growing on a moist bank. Photos by Bob Rutemoeller and Mary Sue Ittner. The last photo was taken late January 2019. 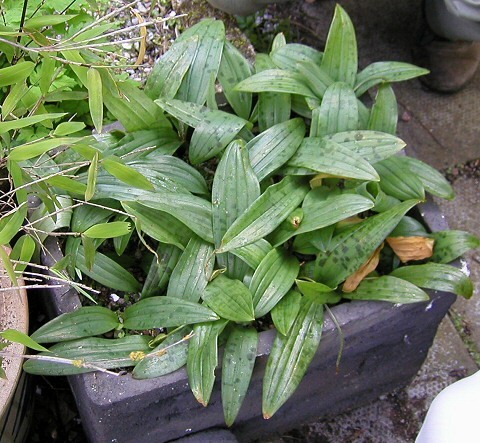 The first picture below was taken in May 2004 of the leaves of plants grown by Ian Young in a deep trough in Scotland where they are kept cool and moist in summer (even though in their native habitat they would receive no rain in summer). Although late in their short growing season, his plants are obviously thriving judging by the large size of the leaves. Photo by Bob Rutemoeller. 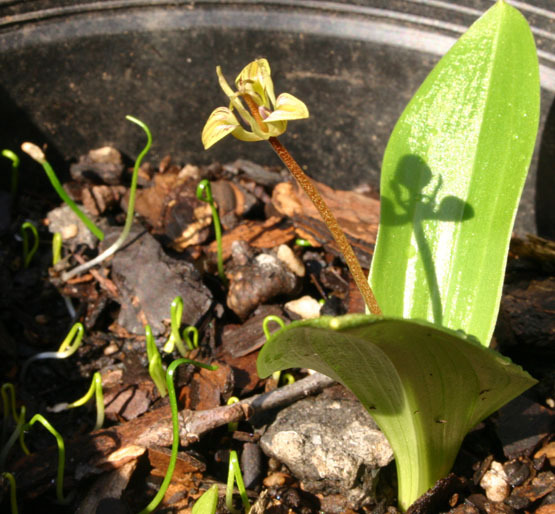 After seeing these, I sunk a pot in the ground and watered it in summer and the pictures following this show my more positive results with a new flower appearing in winter with the leaves, more flowers, the leaves with pods forming, and a close-up of the pod which buries itself in the ground displayed on a 1 cm. square grid. 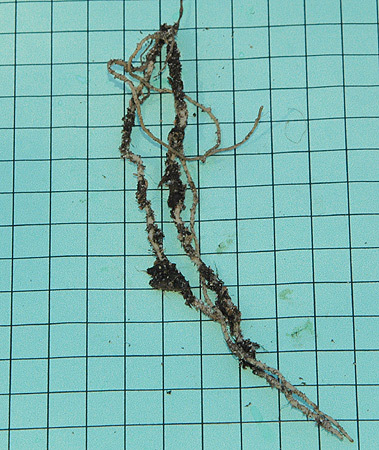 The last photo on the grid shows the plant roots during dormancy. 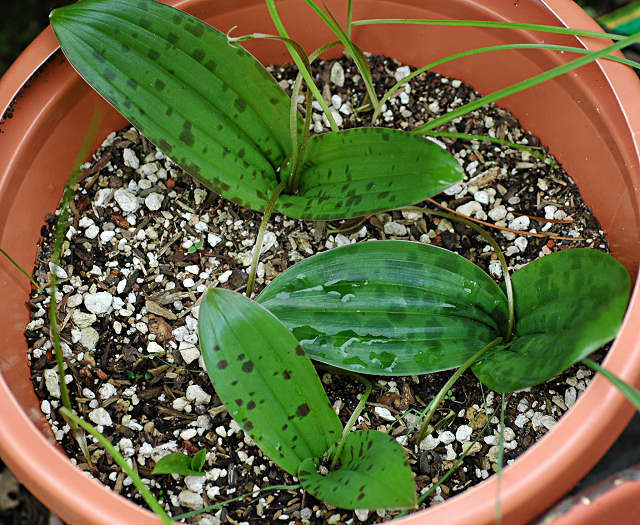 The soil has not been allowed to dry out so they are not as shriveled as some years, but the picture shows that calling this plant a geophyte is a stretch. Photos two through five taken by Mary Sue Ittner. 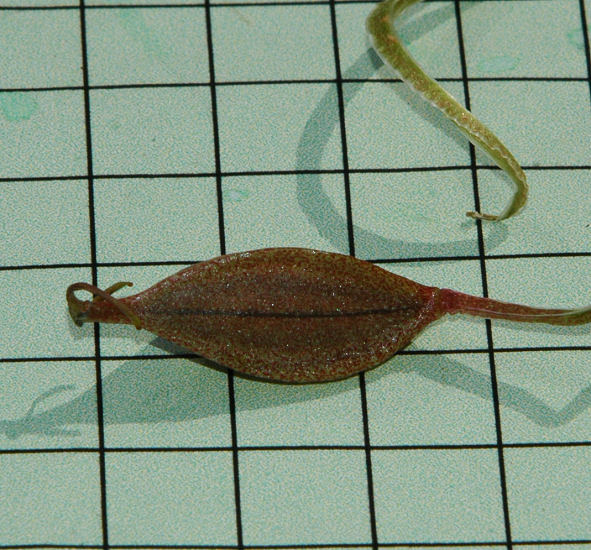 Josef Mayr is growing this plant in Germany in a former artificial pond which was filled with 50 cm (20") of unwashed quartzsand which contains a sizable amount of loam. The top 20 cm (8") was filled with soil from a spruce forest. The plant grows in full sun and every year it receives a small handful of mineral fertilizer NPK (12-12-17) plus magnesium and zinc. 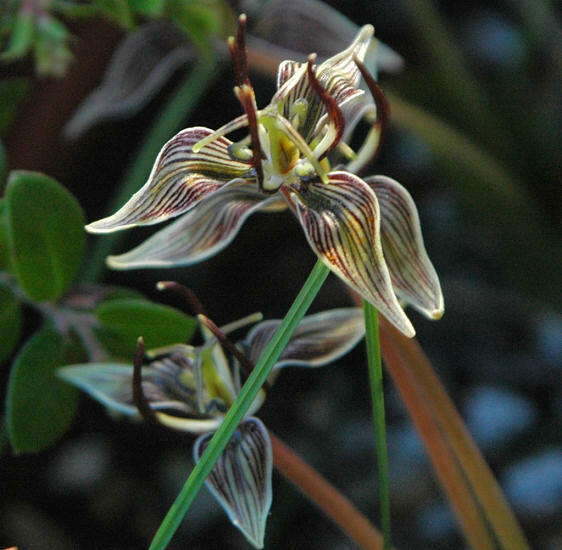 His plants flower beautifully as his picture shows, but do not set seed, probably because he does not have the right pollinators. 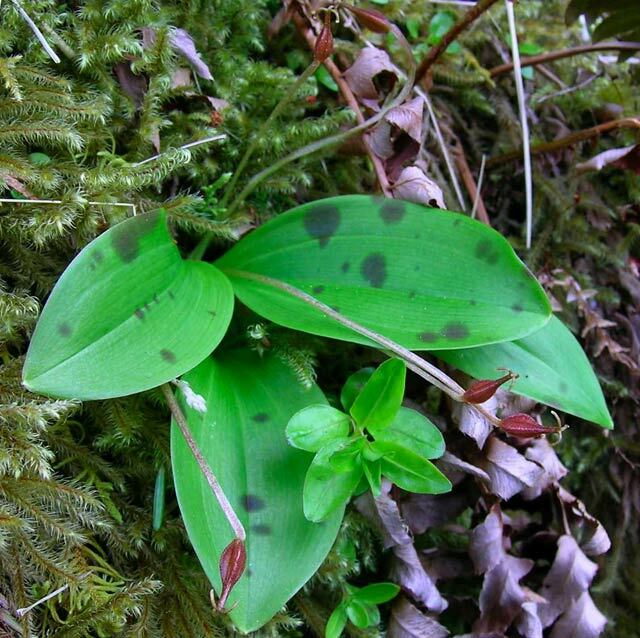 Scoliopus hallii grows even further north than S. bigelovii only in the state of Oregon, USA mostly along the coast and some interior populations. Photo 1 shows it gasping for air in the Maryland garden of Jim McKenney. 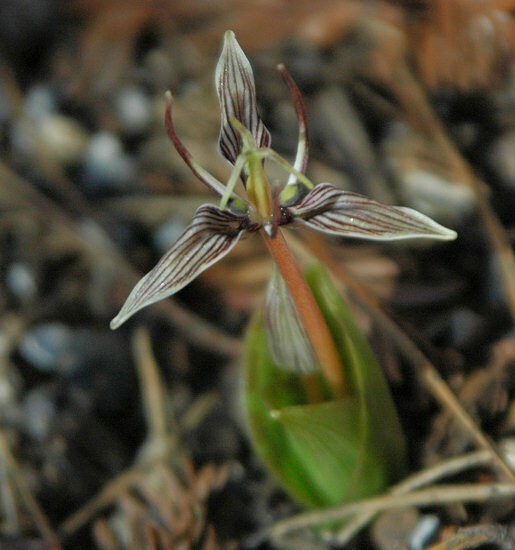 This photo also shows the germination of the seed in epigeal fashion, something I did not expect from a purported Trillium relative. Photo 2 taken by Kathleen Sayce was on a north facing wet slope, Oregon.